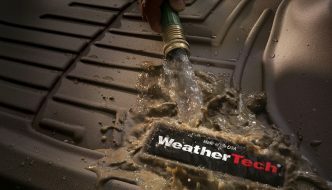 A client from West Fargo recently contacted The Audio Garage for help upgrading his 2014 Moomba audio system. The factory stereo on the Mobius LSV didn’t sound good or play as loud as he wants. 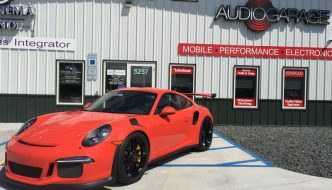 After looking at the design of the audio system and assessing the equipment, we came up with a plan to upgrade the entire system to give him improved performance and features. 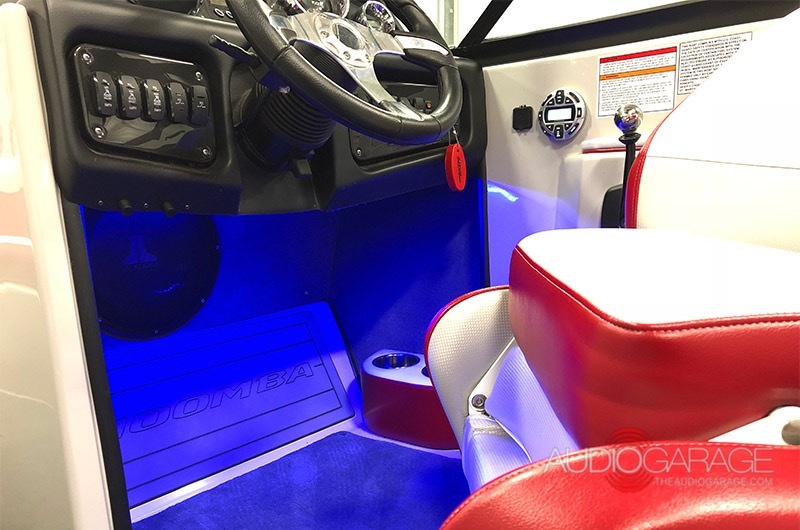 The bow speakers were upgraded with premium JL Audio marine speakers. 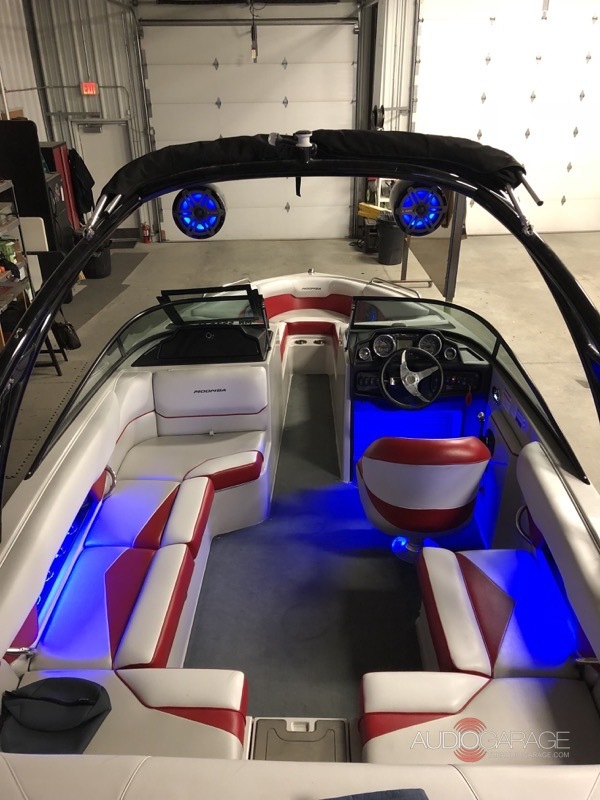 The project started by removing the factory-installed speakers and mounting two sets of JL Audio MX650-CCX-SG-TLD-B 6.5-inch MX-Series marine coaxial speakers in their place. 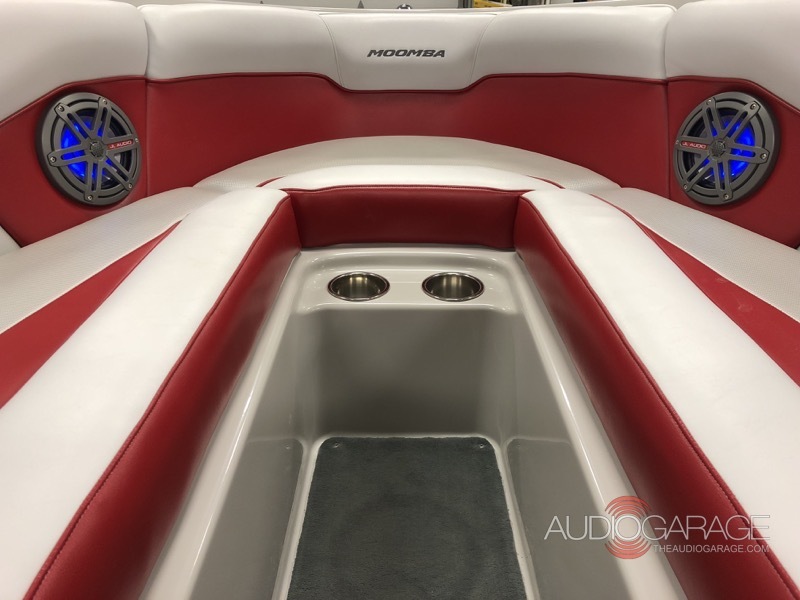 Next, we added a third set of JL speakers to the bow area of the boat to ensure that the music would be distributed evenly for all passengers in all seating positions. We mounted a set of 8.8-inch JL Audio M880-ETXv3-SG-TKLD-B wakeboard tower speakers on the wakeboard bar. JL Audio M-SWMCPv3-2.500 brackets attach the enclosures to the 2.5-inch bar on the tower. Marine-grade wiring was used when wiring the JL Audio marine amplifiers. The Kenwood remote and input plugs are located within easy reach of the captain’s chair. We upgraded the system with a pair of JL Audio M-Series marine amps. An M600/6 is assigned to drive the three sets of coaxial speakers while an M400/4 is bridged to drive the wakeboard tower speakers. 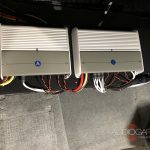 We used a JL Audio XMD-PCS50A-1-L20 6 AWG marine amp kit and JL marine-grade audio interconnects to wire up the amps. The amp kit features yellow and red power wire that conforms to standard marine electrical colors. We also ran new speaker wire to ensure that the system would be reliable and efficient. 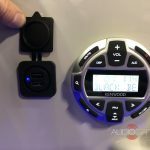 We added a Kenwood KMR-M322BT marine receiver and a KCA-RC55MR remote control to the system so the client can stream music from a smartphone or play music from a USB memory stick. We mounted the remote just forward of the throttle control, so the system is easy to operate. Along with the interior, the tower speakers featured blue lighting. These new JL speakers include bright blue LED lighting in the grille and give the boat a nice glow. We added M-LCA-C-W light caps to the rear of the tower speaker enclosures to light up the interior. Our technicians installed additional strips of blue LEDs above the rear speaker cavities and under the driver cavity. The original cabin lighting switch controls all the lights. After a few days of work, it was time for us to let the client check out his new Moomba audio system. He loved the way the blue LED illumination looked and was blown away by how much better the system sounds. 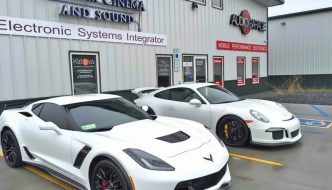 If you are in the Fargo area and are want to upgrade your boat’s audio system, drop by The Audio Garage and speak with a member of our team. 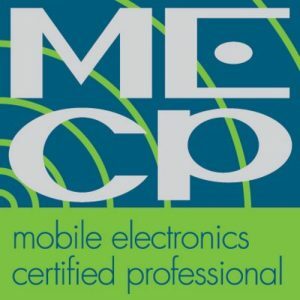 You can also reach us by phone at 701-353-7266 or by e-mail using our contact form.